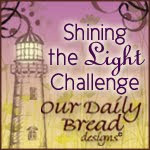 I'm stopping by just long enough to post my card for Our Daily Bread Designs Shining the Light Challenge #123. We were challenged to stamp our own backgrounds. I started with SC 382 from Splitcoaststampers for my layout, but I deviated a bit. I changed the shape of the center panel, and instead of a die cut, I added a sentiment and a side bow in that area. The sketch did get my mojo going, and I really like this layout for using up scraps! I matched two skinny strips of the polka dot dp together and hid the seam under the seam binding. The doily die cut was in my "things to use sometime pile" and was a good color match to the ink I used. Stamps: ODBD "Grunge Cross" background stamp (I turned it on its side) and "Never Give Up"
Papers: White, pink, tan, polka dot dp from Basic Grey "Sultry"
I have tests this week, and I am really looking forward to taking that last one on Wednesday! I'm hoping to not be so exhausted by that point that I can't enjoy some stamping time on Wednesday night..... we'll see! 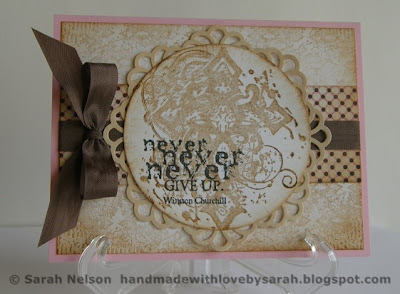 ETA: Thank you to Our Daily Bread Designs for selecting my card for a Shining the Light Award! How soft and beautiful!! I just love your use of neutral colors and the background you created!! Thanks for joining the ODBD Shining the Light challenge this week!! very pretty, I love the touch of pink to it! What a beauty you created here....I love the soft neutral colours...and you framed the cross just perfectly, and the bow adds just the right touch!! Fabulous card! I love the colors and gorgeous bow.